On Monday I got a chance to try out ScratchDC (for free!!!). They delivered a box full of ingredients to make Chicken Tikka Masala to my work and asked me to give it a whirl in my kitchen. 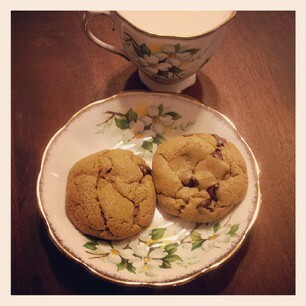 ScratcDC is a local business that comes up with recipes, does all the prep and delivers it to you with directions. The ingredients are mostly organic and locally sourced; the containers are compostable, and the menu changes daily Monday through Thursday. Back to the chicken tikka masala. I skipped the rice. I made the sauce according to the directions, but then pureed it before adding the peas. As for the chicken, instead of broiling it, I simply cut it into cubes and browned it on the stove in a cast iron skillet. The chicken was tender and came already pre-marinated. If you are one of those people who is not good with a knife, TAKE MY KNIFE SKILLS PRIVATE CLASS!!! 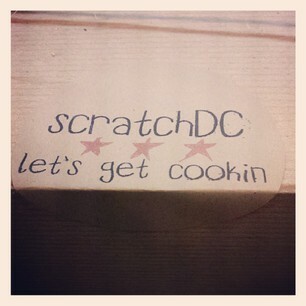 Or order from ScratchDC because everything comes nicely chopped and measured. All you have to do is follow directions, which even tell you what kind of equipment you need. 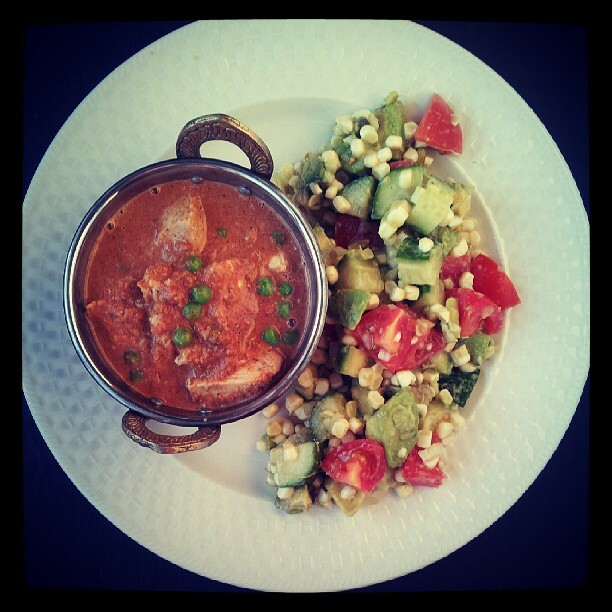 I served the chicken tikka masala with a big salad that had tomatoes, corn, avocado and red peppers. Have you tried ScratchDC or similar services? What do you think? If you want to try ScratchDC, use mangotomato code to get 15% off!!! 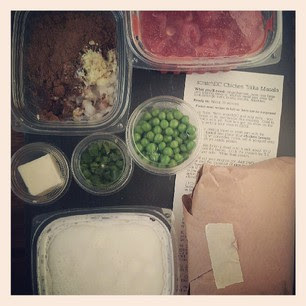 Disclosure: ScratchDC delivered this meal box free of charge for me. I was not paid for this blog post. All opinions are my own. I would be afraid of "everything chopped and ready" from an outside source. Too much risk of bacterial contamination. That can happen in home kitchens, but I've only food-poisoned myself once in 60 years, from accidentally not cooking sausage long enough.